I wanted to spend just a short time blogging about a specific type of chart that is used to good effect in project management, the Pareto chart. The most common applicatio of Pareto analysis in projects is around quality analysis. Paretos are popular in this regard because they graphically display the relationships between groups of data. This is handy in quality analysis because it helps you to identify the 20% of sources cause 80% of the problem. In most cases, the data groups in Pareto charts are displayed as vertical bars, in descending order of significance. 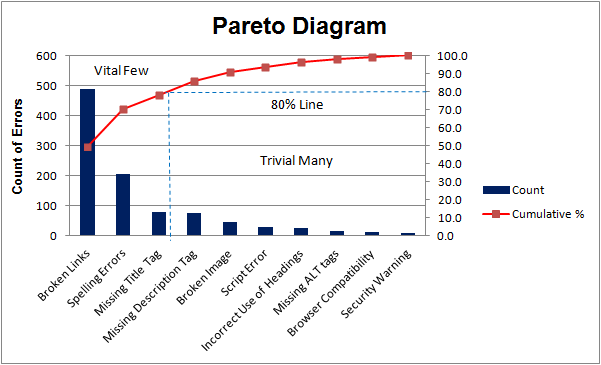 Here is the full link to the MSDN article about creating Pareto charts in Microsoft SQL Server Reporting Services. Many times when I have worked with Pareto Chart in project quality analysis, they have been much more simple in that typically project managers will align the data in a tabular Excel spreadsheet and then build a report in Excel with just a column chart. Here is a sample Pareto used in quality control from iSixSigma. And this is another example, this one from Duncan Haughey, PMP, again showing the use of Pareto analysis by charting the ranking to 100% of defect categories. In most cases, quality engineers will use more advanced tools that have built-in capabilities to create Pareto charts for you as well as fishbone diagrams and control charts. You'll find these sorts of capabilities in SAS & Oracle applications, for example.